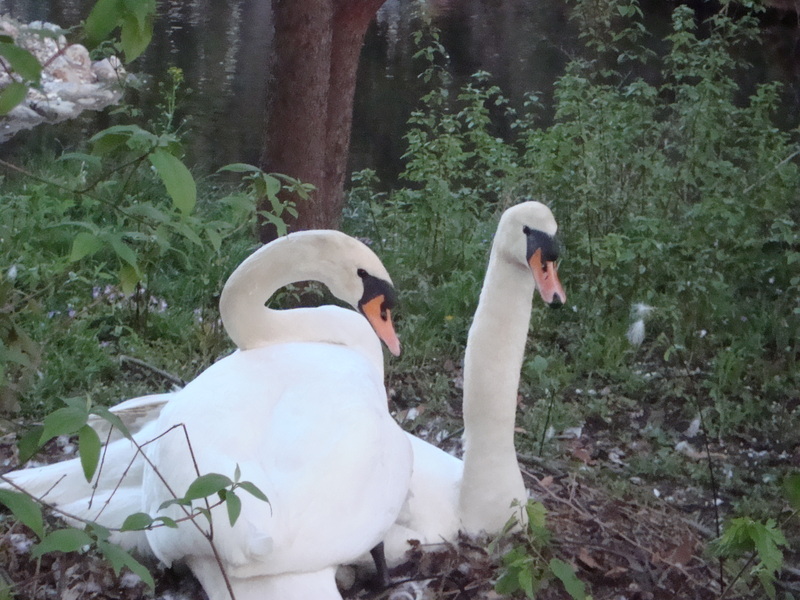 Back in Indiana, someone sent me a link to photos of Iowa State’s two swans on a lake…that was the clincher for me…..I had to come here for graduate school! On this spring day, just to the west of the Memorial Union, red buds adorned the rim of Lake LaVerne. I looked anxiously for the two white swans, but didn’t see them swimming. Then as I was trying to photograph more red bud, guess what I saw?! 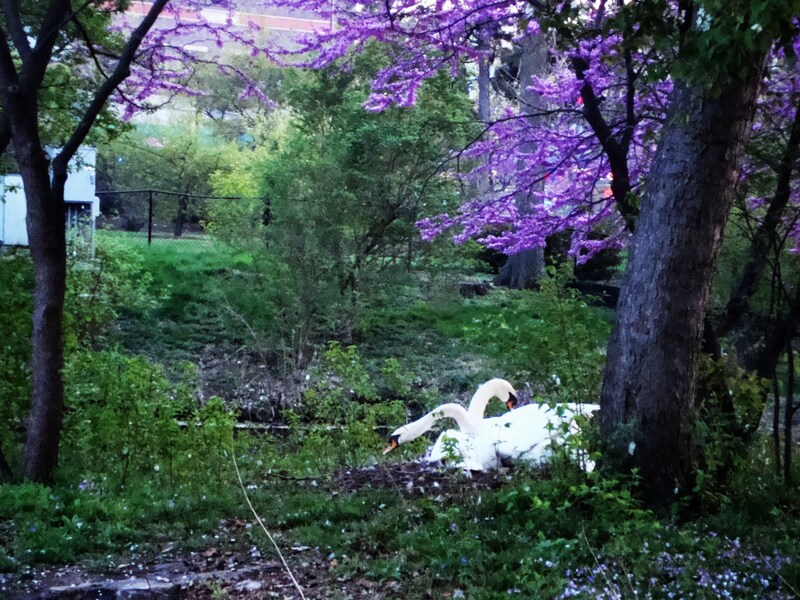 Two lovers, hidden under the trees, with their own little case of spring fever! Today was the day! I feel like spring is about at its peak here in central Iowa, so I took out the Cannon and drove around town to capture the beauty. 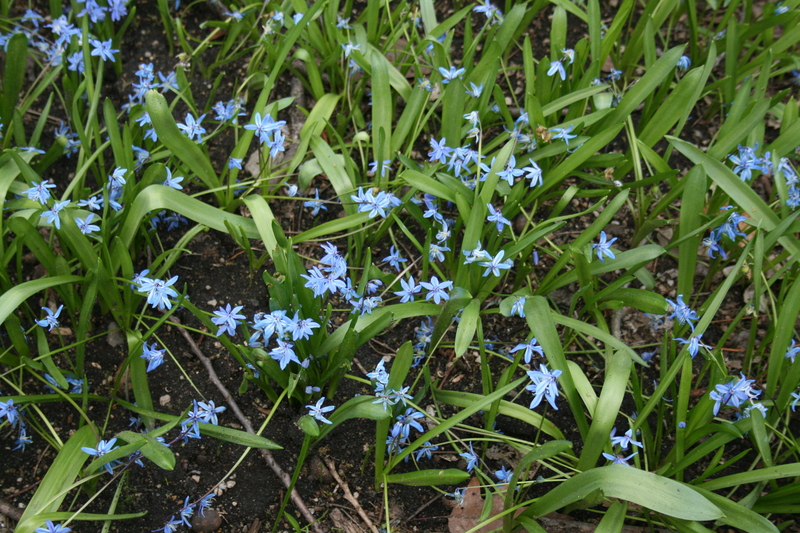 Iowa State University has a beautiful campus and every year when the blue squill bloom it still takes my breath away. 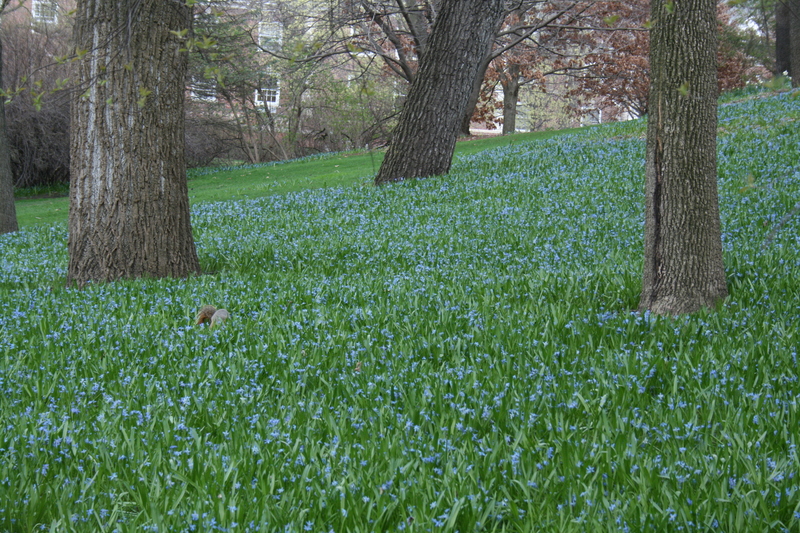 This year I finally got onto campus for some close ups of the patch between the Memorial Union and the Knoll. Ok, ok, please don’t accuse me of objectifying women or some such thing……but as I get older, I appreciate what anthropologist and author Mary Catherine Bateson refers to as the way women “compose a life”. Starting out with dreams of college and saving the world or at least setting it on fire, many of us took a detour through family life, raising children, being full time volunteers, caring for aging parents, cobbling together part time jobs that fit the kids’ needs, sometimes followed by divorce, perhaps more college/collage and then hopefully some semblance of a career. Since reading Bateson’s Composing a Life, I have a new appreciation for our gender and often wonder, when observing other women, what ingenuity, acrobatics and struggles each has gone through to reach her particular place in life. 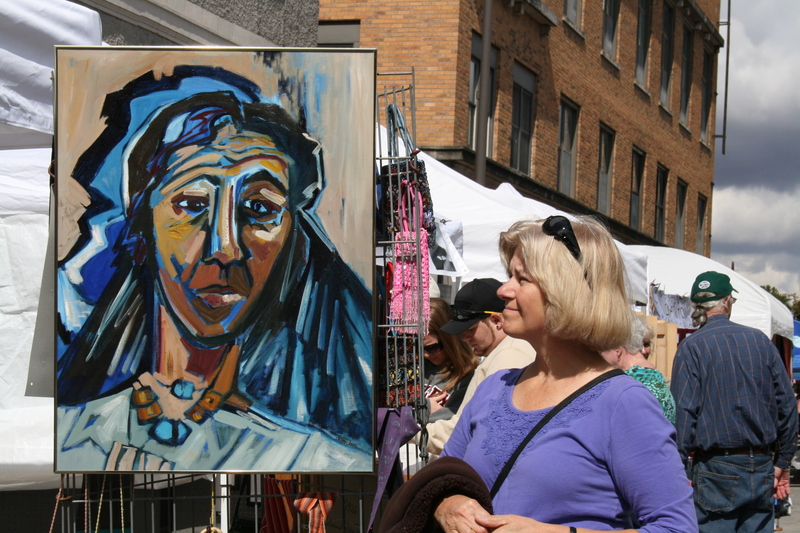 With that in mind, I consider these women at the Ames Art Fair to be works of art themselves. Art has always been important to me, ever since my dad first taught me to draw trees and I heard the story of my sister getting paid a penny a piece for her drawings when she was a girl. I believe that art takes you places. When you are creating art, it takes you outside of or inside yourself, away from what may be bugging you or just down right scaring you to death. When I look at good art, it also transports me for a few minutes, or if it resides in my home, it becomes a little side trip I take every day as I pass by it. I can travel to the world of mermaids, to a park full of bike riders or off to a day in the countryside, just by using my eyes. 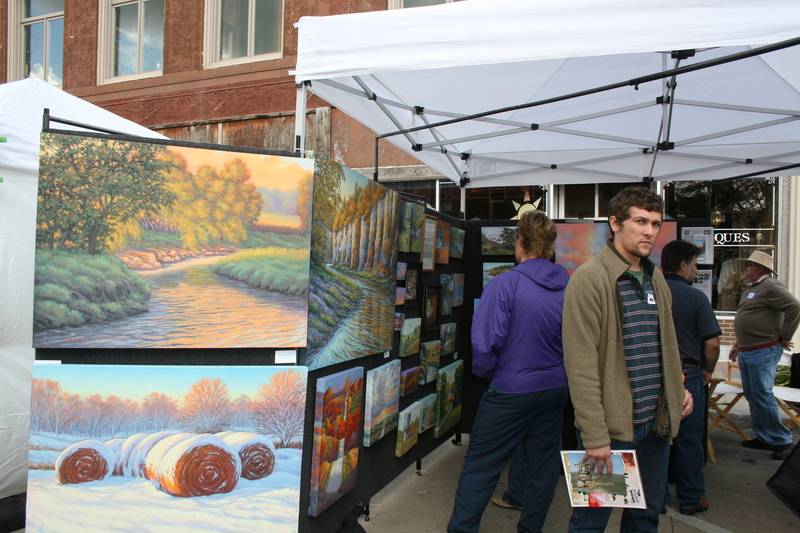 Author sylvanendPosted on October 8, 2011 August 9, 2018 Categories Living in AmesTags Ames Art Fair, stress relief, why artLeave a comment on Why art? 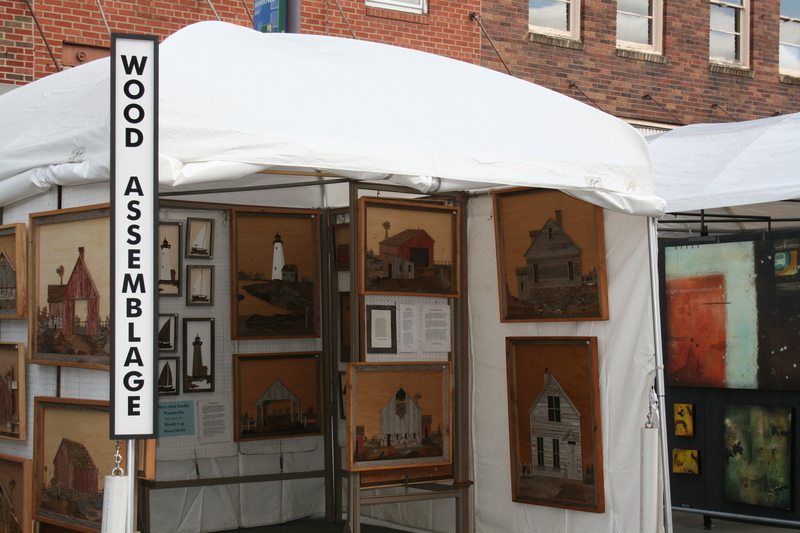 Here was another popular artist at the Ames Art Fair. I loved her fantasy and did not get photos that do it justice, but check out her web site here. Do you want some sweet dragons or fairies for a child’s room? I may have to indulge in a mermaid piece myself one of these days! 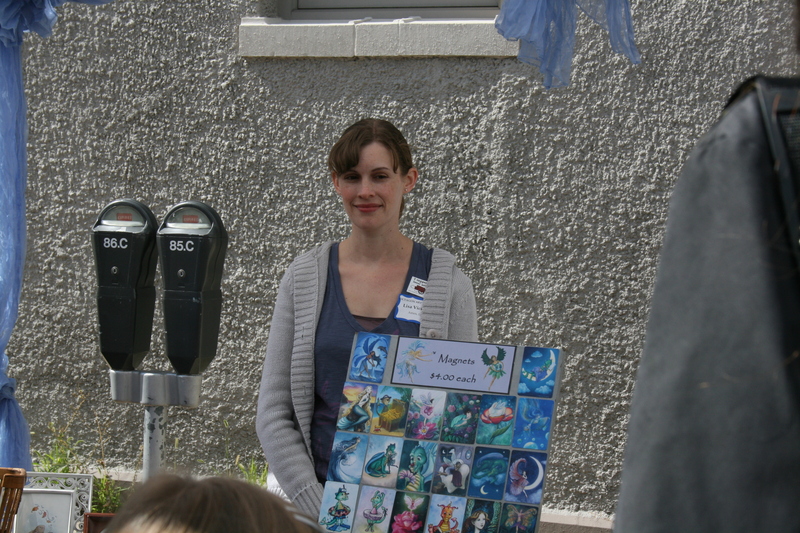 I had a ball at the Ames Art Fair with the new Canon camera my sister gave me! Part of the fun was just hearing the snap snap snap of the fast shutter speed. For some reason this year, I was almost more intrigued with the people than the art, but in this shot I got both. 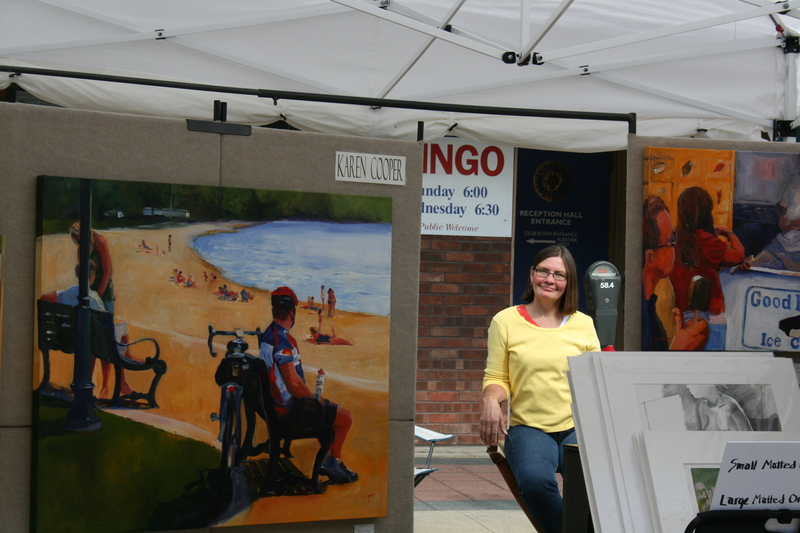 I loved catching the artist just hanging out the way she captures people in her paintings! 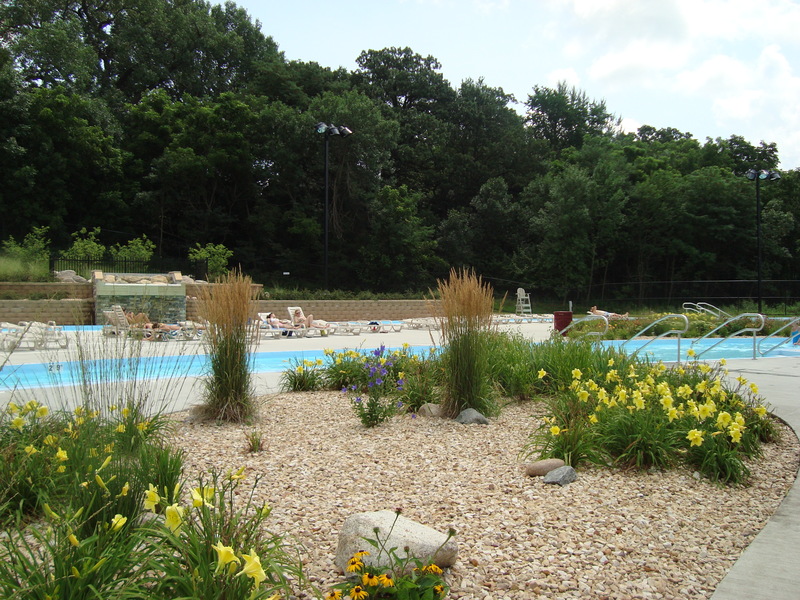 If you are bicycle rider or a RAGBRAI fan, you should check out her web site for more interesting glimpses of life. 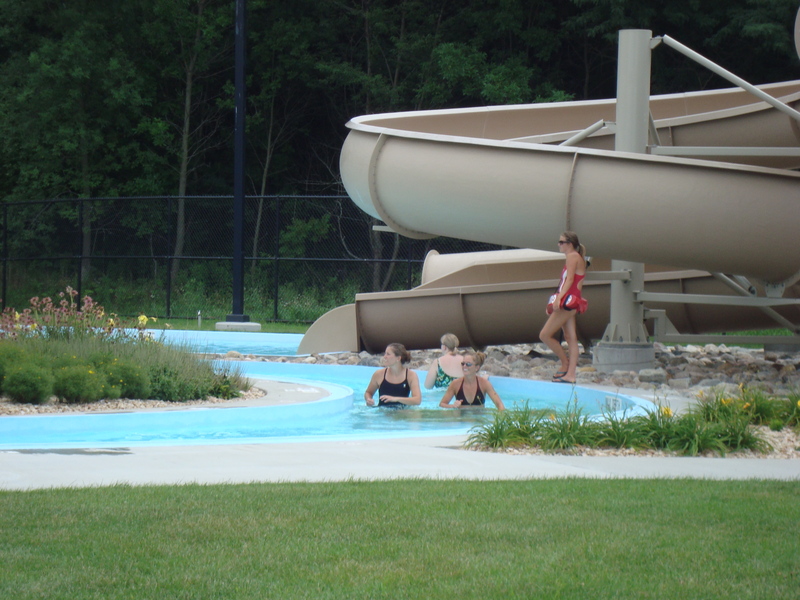 I LOVE water walking at the Furman Aquatic Center in Ames! 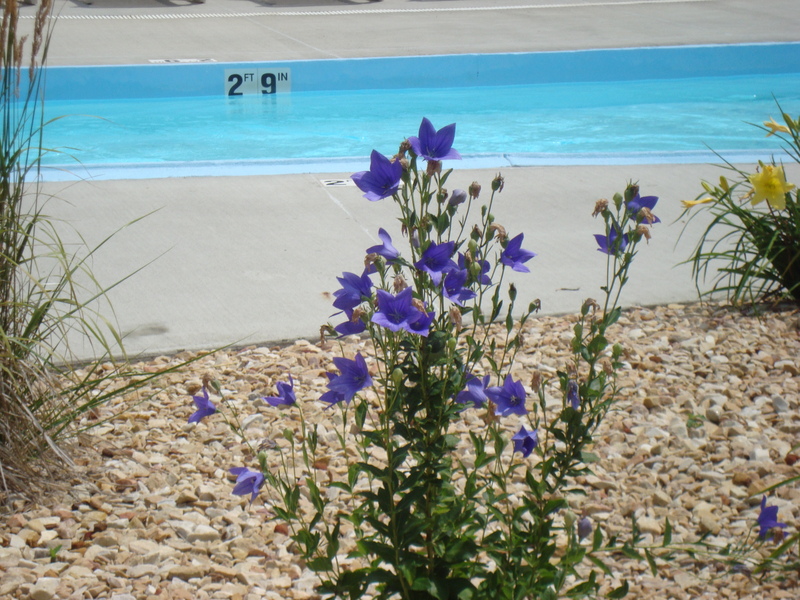 Do other water parks beautify your experience with flowers the way Furman does? Whoever supported the landscaping, I would like to take this opportunity to thank you heartily!